At this stage of my life, I have many friends that I have made during all of the different phases. I have my girlfriends from my hometown--and we still get together at least once a year, I have my work friends, I have my neighbor friends, I have my relatives who I consider my friends as well, and my friends that I made through our children. I have seen several friends go through painful divorces, and watched helplessly as they struggled with emotional pain, and issues with finances, housing, and child custody. My friend, Joanne, is my friend that I met 13 years ago when our sons became buddies at the tender age of 8. Joanne battled all of the struggles of divorce with grace and a strength that was admirable. After being a stay-at-home mom, Joanne began teaching special needs children at the elementary school our kids attended, and provided a stable life for her children. In addition, she continuously made a point of staying in contact with her friends, and leaning on them when she needed a bit more support, as her many siblings and family lived in other states. Fast forward, Joanne was married Saturday, to a kind, funny, lovable man who is crazy in love with her, and I've never seen her happier. I was honored when she asked me to decorate the church and reception site. Of course, I said yes, even though I've never done a wedding before. How hard could it be, I thought! As a northerner transplanted to the south , Joanne and Chris decided to stick to an old southern tradition, the burying of the bourbon. It must have worked, because the weatherman predicted 80% chance of rain, and we had a beautiful day. Built in the 1800's, the small chapel was lovely. Without any decoration, it was simply beautiful. I made pew bows from tulle, and inserted yellow roses, baby's breath, and ivy. Each bow took about an hour to make, so I started weeks in advance. Of course, all florals had to be done at the last minute. I also decorated grapevine wreaths with artificial magnolia blossoms, gardenias, and ivy. These were hung a week early, to avoid the last minute rush. Fortunately, a friend and owner of the property where the reception was held, helped us hang them. He is also a board member of the chapel. The arrangements in the back by the door were made from blue hydrangeas, yellow roses, alstroemeria, and curly willow and are in plant stands from my yard. I loved the tall windows with the point at the top. Wreaths with fresh flowers and greenery were hung on the doors. White tulle and yellow ribbon bows were hung on the outside railing of the chapel. At the front of the church, is a baby grand piano, which Joanne's daughter played for the service. She is 17, and it sounded beautiful! I used a table from the church house next door, and decorated it with a center arrangement of yellow roses, white carnations, yew, and magnolia leaves. The globes held candles, which we added later. To the right of the arrangement is a vase for the unity sand. 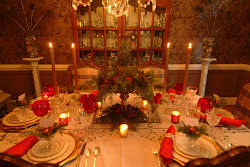 The candelabras were handmade, and I used the same decoration as I did on the pew bows. Two kimberly queen ferns in fishbowls were front and center. Since open flames aren't allowed in the church, we used battery-operated candles, which looked great. A silver neo-classical vase (estate sale) held two magnolia blossoms and leaves. After a sweet ceremony, which fit their personalities to a T, everyone moved down the road to a property affectionately referred to as Mudcat. Seems the owners, who are friends of the bride's, found a sign when they were building and clearing out the property with Mudcat on it, and the name stuck. Their property is on the James River in Powhatan, Virginia. I can't even explain how beautiful it is. The happy couple enjoys a glass or two of vino, so a wine theme it was. You would think with all the wineries around here, I could come up with a wine barrel, but this was as close as I could get. Served the purpose. This is the entrance to the pool, which served as a guide for guests to go to the gift and sign in tables, and grab a drink. Lanterns on shepherd's hooks lined the sidewalk. They looked so pretty in the evening. We added magnolia and yellow bows. Didn't get a chance to supervise this, but turned out ok.
Luckily, the wedding planner had the lanterns available to use. I borrowed shepherd's hooks from my cousin, and made the yellow bows. I found this cute wooden sign at an estate sale. I painted it white and used a computer tutorial for the lettering. Fortunately, Cindy--who is the owner of the reception property, is an artist and added some beautiful touches to it, really making it pop. The sign-in/gift table held the arrangement from the chapel. Instead of a guest book, we did the message in a bottle, straight from Pinterest! Loved that idea. 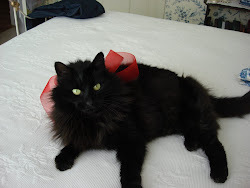 Meant to use ribbon to roll up paper, but just ran out of time. Everyone got the idea, and the bottles were given to Joanne and Chris to figure out how to get the messages out. Probably will have to break the bottles, ha! The wedding attire was very casual, and most men wore shorts and short-sleeved shirts. Women wore sundresses, and flats or flip-flops. There were 12 6-top tables, so I made 12 floral wreaths and we added these lovely hurricane globes--which were provided by the wedding planner. To keep on track with the theme, we added corks as vase fillers. By the time I got to number 8, I was a bit tired. We brought over the pew bows and tied them to the tent stakes. On the high-top (bar) tables, we placed a charger with three wine bottles, filled with fern, hosta leaf, and yellow daisy mums. Grapes were added to ground the centerpiece. Silver mercury glass votives were lit at dusk. We took the arrangements out of the metal planters from the chapel, and used them to decorate the dance floor on either side of the DJ. Torches were added along the stone wall, to keep tipsy guests from falling off! A few bows had slipped down because of the wind at picture taking time. If you look closely, Scott, the property owner, used his tractor and cut a large heart in the field below, sorta between the two trees. So very cool! Paper lantern lights were hung around the pool (Chris, the groom, was in charge of that job) and we put LED cool icicle lights on the fence. It was gorgeous in the evening! A friend of ours, and a dear friend of Joanne's, Bill, did all of the cooking for the reception. His mother helped him, and 4 teenagers helped with serving and refilling trays. We used wine bottle candelabras on the food tables. We also used cork holders for the menu cards. Instead of a buffet, there were different food stations. The first station held appetizers, consisting of cheese platter, fruit platter, wings, and prosciutto wrapped asparagus. Mozzarella tomato skewers and ham biscuits were passed. Best ham biscuits I've ever eaten. Gotta get the recipe. Didn't get pictures of the other stations, as they were setting up while I was taking pictures. Station 2 consisted of BBQ, BBQ chicken, rolls, two types of sauce, baked beans, corn, and cole slaw. Station 3 consisted of beef tenderloin sandwiches, smoked salmon, and salad. It was all soooo delicious! The couple decided on a small cake to cut, and individual cupcakes. We decided to use different silver pieces for display instead of a cupcake stand. We had hoped to use greenery as decoration on all the food tables, but just ran out of time. The magnolia arrangement from the chapel was placed on the cake table. Joanne and Chris share a bite of cake! Joanne and her two children, Hannah, and Kellen. Kellen walked his mom down the aisle, and Hannah played the piano and was her mom's attendant. Joanne, her son Kellen and daughter Hannah, with Kellen's best friends. L to R, Kevin, Kellen, Hannah, Joanne, Phil, and my son Mitchell! It was a happy, beautiful day! At this point, I stopped taking photos and began having fun! We danced, ate, drank, talked, and celebrated with the bride and groom and their lovely families. At the end of the night, there was a fireworks display in the lower field. I was honored to be involved in such a wonderful celebration. Joanne and Chris are off on their honeymoon. We will get together with them when they get back to look at pictures and rehash the events of their special day! Thanks for looking and visiting with me! 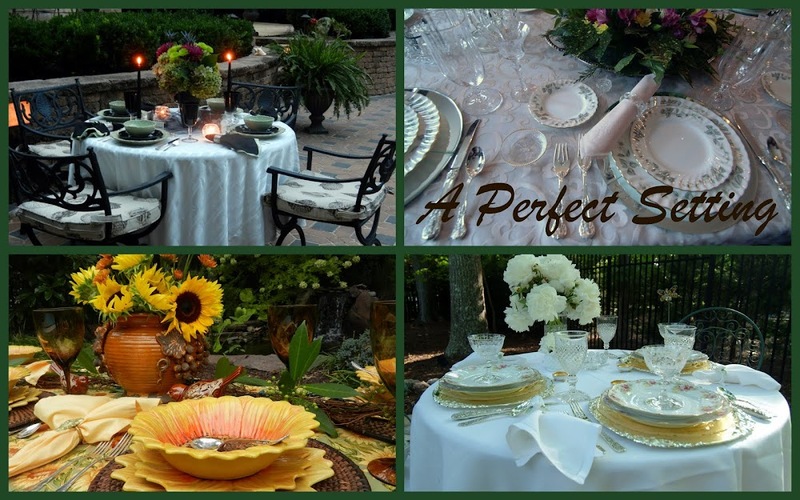 It was, indeed, a perfect setting! Hi Gail, yes I had really been worried about the weather, but, fortunately, it all turned out! Hope you had fun at your reunion! Oh my that turned out wonderful! I love love love how the church looked. Those wreaths hanging in those windows really added a delicate country charm and the tule bows at each pew are wonderful! The front of the church looks fabulous- love how the ferns softened things up and the pretty lace piece draped over the piano added romance. I bet the candelabras looked great lit up and created a nice backdrop. I like all the details you put together for the reception especially the wreaths with the glass hurricane! You really did a wonderful job! How sweet to have both her son and daughter involved in such special ways at the wedding. I'm glad for your friend that she found a new love and someone she can count on again. Wishing them both a long and happy marriage!! Hi Liz, thanks for your comments, there were a few things that we just didn't have time to do, but other than that, it was a wonderful day! Hope you have been doing ok, haven't been on in a while, I need to go back and catch up on all your posts! Will do that as soon as I have a minute. Anyway, thanks for stopping by, stay cool!! Thank you so much for your kind words. 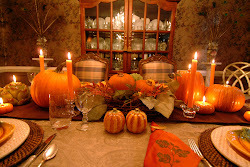 I hope to post a few tablescapes again every now and then, stay tuned!! Hope you had a wonderful Fourth! I have never heard of the "burying of the bourbon" tradition, but it sounds like a winner to me! Is it only for weddings? We have a couple of events coming up for which perfect weather would be so nice!!! First, congratulations to Joanne and Chris! I am very happy for them both. Love can be SO much better the 2nd time around, and I'm glad she has that chance to give and to receive it. The peaks of those church windows immediately caught my eye. How cool!!! I would LOVE to have windows like that at home!!! You did a WONDERFUL job at both the chapel and the reception site!!! The sign is wonderful, and the decor is just beautiful!!! THAT HEART IN THE FIELD!!!!! Oh, my goodness!!! How cool is THAT??!?!?!?! WOW!!! That picture ought to be sent to the John Deere people (or whoever the tractor/mower was made by)! HUGE kudos to Bill for the fabulous food!!! What a guy! If you get the recipe for those ham biscuits, please do pass it along to the rest of us! You got a lot of great pictures, Betsy, and I'm so glad you shared them with us! I also glad that you finally put that camera down so that you could join in the fun with everyone else!!! What a wonderful day for a wonderful couple. I wish them much love and happiness in the coming years. And as for you, young lady...congratulations on a job VERY well done!!! Thanks. Alycia, first wedding for me, I could have used your expert advice!! All in all, it was simple, but I think everything turned out well, especially for a second wedding. I think any decoration that was added to that beautiful site was just icing on the cake! We are coming off a gorgeous Fourth of July weekend, our weather was perfect with no humidity. Hope you are experiencing the same, and are having a relaxing, fun weekend!! OMG, you did an amazing job, the detail was incredible, right down to the heart cut lawn! I LOVED everything! The church took my breath away! Beautiful job, I think you found a new career!